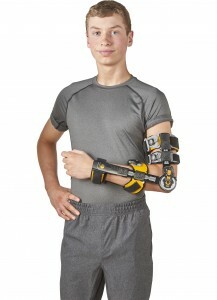 Introducing the Contender™ Post-Op Elbow, an orthosis that brings innovation back to bracing. Simple and precise ZipTrak™ adjustment system minimizes fit time while the aluminum humeral, forearm and wrist cuffs are easily contoured by hand to provide a secure fit and help limit brace migration. The Contender is also the only post-op elbow with a removable biceps cuff that helps avoid incision site irritation while promoting greater flexion range at the elbow. every brace. Sized hand attachments are available separately that allow the wrist/hand to be positioned in neutral, pronation or supination. that can be discretely locked using our unique FlexLok™ band. Length - Adjustable 14"-19.5" Fits biceps circumference up to 22" and forearm circumference up to 18". Measurement taken from wrist circumference.